Lindsey said Laken’s bloody nose on this particular night was unusually bad. Trying to calm her distressed son, Lindsey reached for the Afrin to stop the bleed. Lindsey, a Clinical Risk Manager at BSA Health System, knew Laken’s nosebleed required immediate medical attention. Clutching her son’s nose with a kitchen wash cloth, the two were taken by ambulance to the Emergency Room at BSA where Lindsey’s husband met them. A familiar face in the BSA Emergency Room was unknowingly exactly what Lindsey needed in a time of panic and worry. The leading physician assured her that her instinct to call 911 was the right decision. “The physician sat down next to the stretcher and reassured me that I did the right thing by calling 911 because people can die from bloody noses,” Lindsey said. The Kinards learned that Laken’s nosebleed was due to a nasal arterial hemorrhage, which is blood loss from an artery in the nose. The Kinards stayed in the BSA Emergency department for several hours. 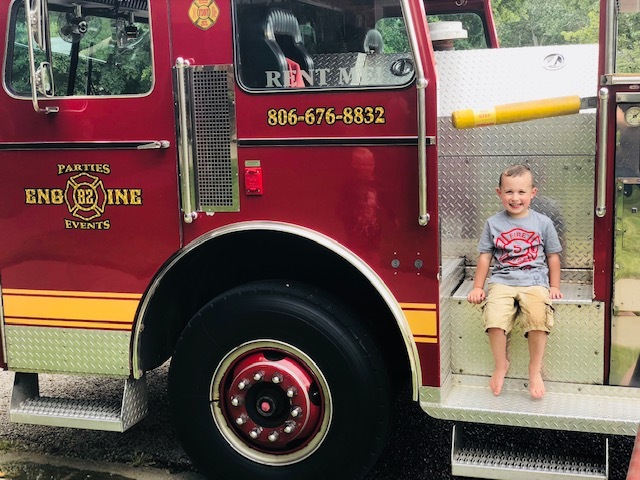 Once the bleeding stopped, staff put antibiotic ointment gently on the base of Laken’s nose to keep it moist until Laken’s appointment at BSA Panhandle Ear, Nose & Throat later that morning. A few hours later, Lindsey was on her way to meet her husband and son at BSA Panhandle Ear, Nose & Throat when she received a call from her husband informing her that Laken’s nose began bleeding again. It was quickly decided that Laken needed emergency nasal cauterization. Laken’s nose had been cauterized at Quail Creek Surgical Hospital two years prior. A nasal cautery or cauterization is when a specialist uses a chemical swab or an electric current to cauterize the inside of the nose, sealing the blood vessels and building scar tissue to help prevent more bleeding. Once the Kinards arrived at Quail Creek Surgical Hospital, the staff quickly prepared Laken for surgery. The team let Laken wear his pajamas in surgery and gave him a stuffed bulldog to comfort him. After administering general anesthesia, the emergency staff was able to insert a scope camera into Laken’s nose and perform nasal cauterization in both nostrils to stop the hemorrhage. The Kinards were pleased with the care and compassion received at Quail Creek Surgical Hospital. After Laken’s surgery, one of the nurses got Laken peanut butter cups from the vending machine to help him feel better. Fully recovered and only one nosebleed since, Lindsey Kinard is thankful for BSA. You can't predict when a medical emergency will happen, but you can be prepared. In the event of a medical emergency, choose BSA. For more information about the BSA Emergency department, please click here.